Believe it or not, dog bites do occur. It is easier than you think. They are not necessarily from dogs that are vicious, but rather can be from dogs that are approached when the dog is least expecting it. If your dog is frightened, not feeling well , or even in a strange situation it is possible for your dog to bite. How can we prevent being bitten by a familiar dog? Believe it or not the most frequent times a dog will bite is if the dogs is left with an unattended infants or kids are playing with a dog without an adult supervision. Both of those scenarios are easily avoided. However, what do you do if you see a dog that you are not familiar with on the street. Just because the dog “seems cute” do not immediately go over and pet the dog. The best advice is to WAIT. 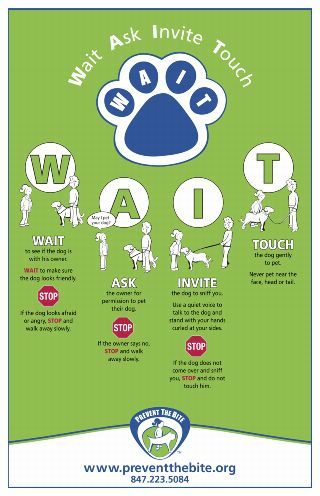 WAIT is an acronym that can be used to teach children and others on how to approach a dog (from the American Academy of Pediatrics) that is on a leash with their owner. The W in wait stands for wait, A is for ask if you can pet dog, I is allow the dog to sniff you. T is for touch. It is now OK to touch the dog. These are great steps to teach your children to learn how to approach a dog. It is not a good idea to assume that the dog is friendly and wants to be touched. You need to WAIT first. Getting bitten is easier than you think If you see a strange dog, not on a leash do not go over to pet it. Being cautious is prudent and safe. The following if from the American Veterinary Medical Society brochure on dog bite prevention. • If your own dog bit you, confine it immediately and call our veterinarian to check your dog’s vaccination records. Consult with your veterinarian about your dog’s aggressive action. Your veterinarian can examine your dog to make sure it is healthy, and can help you with information or training that may prevent more bites. • If someone else’s dog bit you, first seek medical treatment for your wound. Next, contact authorities and tell them everything you can about the dog: the owner’s name, if you know it; the color and size of the dog; where you encountered the dog; and if, where, and when you’ve seen it before. These details may help animal-control officers locate the dog. In addition, consider asking your physician if post-exposure rabies prophylaxis is necessary.